Looking for something new at a bigger school with more opportunities, Northampton High School senior Alyssa Moreau came to the right place. 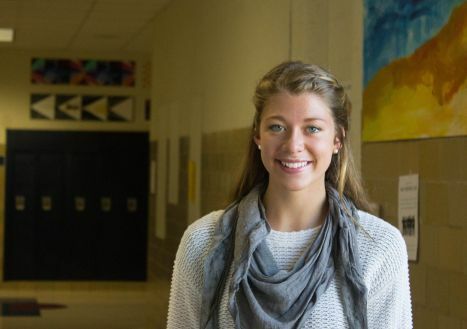 Previously attending Gateway Regional, she found her class of less than 60 to be too small, so she ventured out to NHS. “Northampton is much more diverse”, said Alyssa, a Huntington native. Since many of her friends had graduated from Gateway in the last year, she decided that it was time for a change. Moreau said she switched to NHS because she also “wanted to experience something bigger before college.” She believes that NHS has unique opportunities and classes, such as journalism, a career in which she’s interested. She signed up for that class because she’s thinking about majoring in journalism. “It’s finding out people’s stories in a creative way,” said Moreau. Moreau said that despite leaving a school she knew well, she is comfortable at NHS. NHS has “so many more options, like classes such as Black History.” Northampton also has twice as many AP class options as Gateway, which was another draw for Moreau. Through Moreau’s eyes, people here are welcoming, kind, and accepting. She likes the atmosphere in town, and after only two days at NHS she’s raising her hand in journalism class and waving to familiar faces in the halls. She especially found a sense of comradery on the varsity soccer team, and said she is excited to be playing the position of wing for the first time this year. “It’s good to be part of a team,” said Moreau, “especially on the first day of school,” where her teammates walked in with her and helped find her classes. Big changes can be scary but rewarding, and Moreau shows that sometimes it just takes a leap of faith. “My decision to leave Gateway was something that not many people would do because by senior year people are usually comfortable enough in their school setting…not many people are brave enough to risk giving that up,” said Moreau.